There's an exciting new video game console on the horizon. It's called Ouya. It doesn't exist yet, though over 34,000 Kickstarter backers have opened their wallets to ensure that it will. Ouya has made all of its money—over $4 million during its first 48 hours on Kickstarter—on three major selling points: 1. It will only cost you $99; 2. It will allow you to play Android games on a television, with a controller; and 3. It is completely hackable. Take another look at that third one. Unlike, say, any of Microsoft, Sony, Nintendo, or Apple's devices, Ouya actually wants you to crack it open and play around with its guts. You'll have free reign to modify its interface and stuff its hard drive with fully-customized programs. You could download and emulate old Super Nintendo games. You could watch illegal streams of live sporting events. You could set your television to display nothing but cat GIFs. The options are limitless—even if your hacking knowledge is limited to MS-DOS commands, rest assured that it will only take hours for a very large library of third-party mods to start circulating. 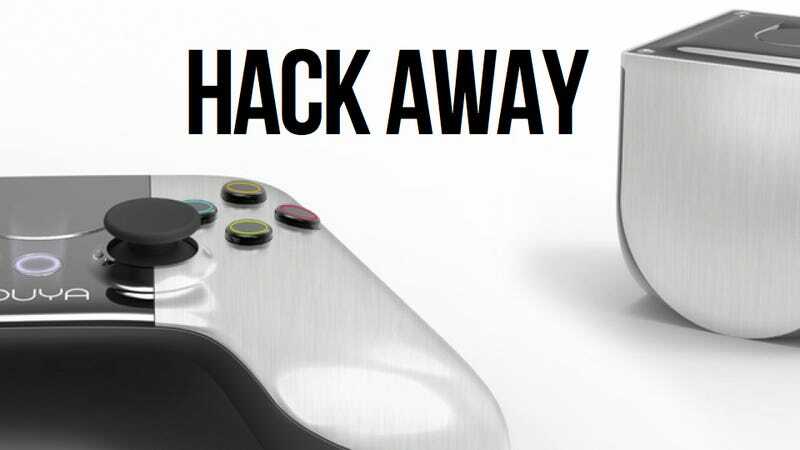 "Have at it: It's easy to root (and rooting won't void your warranty)," Ouya's creators write on their Kickstarter page. "Everything opens with standard screws. Hardware hackers can create their own peripherals, and connect via USB or Bluetooth. You want our hardware design? Let us know. We might just give it to you. Surprise us!" This could be the most pirated console in gaming history. Surprise: this could be the most pirated console in gaming history. Users who jailbreak or modify its hardware won't have to worry that they might be doing something illegal or breaking their expensive systems for good. And they won't have a very difficult time finding easily-accessible ROM and ISO files for every game imaginable, from NES classics to brand new Ouya titles. Piracy is a serious problem on PCs; on Ouya, it could be the norm. While this might be wonderful for customers—and I've spoken to some gamers who love the idea of a $99 box that can emulate anything—it could be a serious problem for the people who make video games. If game designers are worried that whatever they make will be immediately stolen, why would they even bother developing Ouya-exclusive content? And as a brand new, independent device with a limited userbase, Ouya will have a very difficult time getting off the ground without its own exclusive killer app, its own system-seller like Halo or Mario. The console could live or die based on this one problem. I asked Ouya CEO Julie Uhrman whether their developer partners are worried about piracy. "No, developers haven't said they're concerned," Uhrman told me in an e-mail. "Developers should know that—despite the openness of our platform—all paid content on Ouya will require the user's payment to be authenticated by us. We want developers to be rewarded for the value of the games they make." She says there will be an app submission model. She also says every game will have optional DRM, or digital rights management, the anti-piracy tool that has become something of a curse word in gaming today. "Developers haven't said they're concerned." And industry analysts also seem unconcerned. I spoke to Wedbush Securities' Michael Pachter, a big supporter of Ouya, to hear his thoughts on whether piracy would be a concern for the system. "I think most games will be developed for Android platform, so that generally means free to play," Pachter told me. "I don't know if piracy of $4.99 games is a problem on Android tablets or not, but likely not a huge risk. Most consumers will pay if prices are reasonable; iTunes is proof of that." But it's hard to believe that gamers, when encouraged to hack and customize this console, won't use it to run illegal software. Unless there's some sort of concrete infrastructure that makes it more convenient and fun to buy games than steal them—like, say, Steam—I think pirates will have a field day with Ouya. On the flip side, this could be awesome for us. You won't have to worry about region-locking or warrantee-voiding or any of the other issues that can make normal consoles such a royal pain to use. You'll be able to use customized controllers, play games from anywhere in the world, and even add fan-made English patches to certain Japan-only titles that may or may not be named Mother 3. But as Valve's Gabe Newell has said often, piracy is not a pricing issue; it's a service issue. Everyone is willing to spend money when it's easier or more beneficial or more rewarding than downloading a game for free. But Ouya's service is that it's a hackable platform. It's a pirate's playground. Which could be great news for emulator-loving gamers—and awful news for Ouya.